It’s been over two years since I’ve talked about my books on the radio, and I’ve written a few hundred thousand words since then, but the long national nightmare is finally over. Tune into KOOP FM 91.7 (or online at koop.org) at 6 pm CST on Wednesday 1/28/2015 to hear me discussing Postcards from Fred and Open Season on the program Writing on the Air. To hold you over, here are some highlights from the 2012 show. There’s been some discussion of subtext among my fellow writers. I’m speaking in terms of the second definition from Collins English Dictionary. Mary married Trevor, the oldest son in a wealthy, traditional family. Mary has been having an affair with her husband’s younger brother, Steven. A few days after Trevor’s murder, Betty, her sister-in-law, shows up at Mary’s house. Mary answers the door. They are both the outsiders in the family. Betty: I thought about phoning but then I thought, well, that was the easy way, so . . . here I am. Mary: Do you want to come in? Betty: How are you bearing up? Mary: Alright. Don’t think it’s sunk in, yet. Mary: Yes, everyone’s been very kind. Betty: Good. If Stephen and I can do anything to help, then you will let us know, won’t you? Mary: Thanks. You’re very kind. Betty: We wouldn’t want you to be alone, unless of course you prefer it. One of us could stay with you if you like. Mary: No. No, that won’t be necessary. Betty: You sure you don’t want me to send Steven round. I mean he could sleep on the sofa or something. Just until you’ve over the worst of it. Mary: I wouldn’t dream of imposing on him. He’s got enough on his plate as it is. Betty: He wouldn’t mind. He can sleep anywhere. It makes no difference to him. Shall I lend him to you for a while? Mary: Dangerous. I might want to keep him. Betty: I don’t think so. He is very unreliable, you know. A lot of unexplained absences. The solution is left as an exercise to the reader. On this blog I mainly talk about what I’m reading, not what I’m writing, and almost never about the process of writing. But I’m powering through the first draft of my next novel and I thought one or two of you, or maybe even all three of you, might like a peek behind the plywood barriers into the construction zone. If not, move along. Nothing to see here.When people find out I’m a writer, many of them say they want to be a writer. My response is, “All you have to do is write.” It’s really that simple. If you write on a regular basis, you’re a writer. You may be a bad writer, but you’re a writer.But what most people mean when they say they want to be a writer is that they want to be published. That’s another thing, entirely.As James Scott Bell said a few days ago, “Many people say, I have a book inside me! Usually that’s the best place for it.” I would have stopped there, content to discourage the competition, but he continued with, “Learn the craft and write more than one.”I’m going to explain some of the mechanics I go through. This is not really part of the craft of writing, but it’s something I use to keep track of my level of productivity, which is important when you’re working on a deadline.When I’m in first draft, I keep a log of hours and word count. It looks like this. The first column shows the number of words in that session, then the date, start and end times, total hours, words per hour, then word count and hour count per day and per week.You can see that in this period my words-per-hour ranged from 182 (on what evidently was a particularly bad day) to 500+, which is where I like to keep it. (I once got up to 800+ words per hour in the final chapters of the first draft of Hell in a Briefcase. Oh, those were the days!) Most serious novelists have a word count target for for the finished work and a daily word count target. My routine is to set aside 2 nights a week and a significant chunk of the weekend when I’m working on a novel. As you can see from my journal, I’m not all that consistent, but I track my progress and if it gets low, like those two weeks where I only worked one day each, I kick myself into gear the next week. My goal is 8 weeks to a completed first draft. I started this novel on 12-18-09 with a 1-hour session of 330 words. My target is to be done by 2-18-10. I will cut myself some slack if I don’t make it since I had to take some family time for the holidays.I recently read a biography of P. G. Wodehouse, who wrote 90+ novels in his 90+ years. He was always very aware of word count and productivity. He did a daily 2,500 words or more during the bulk of his career, and when he was in his 80s and 90s, he still averaged 1,000 words a day.When he was 69, he had a day where he produced 27 pages while working on Barmy in Wonderland, beating his previous record of a 26-page day while working on Thank You, Jeeves, noting that “there is life in the old dog, yet.” Figure 250-300 words per page and you can see he hit around 7,000-8,000 words that day, which beats my top end so far for this novel of 4,332 for an 8-hour day on New Year’s Eve.I also track information on each chapter to try to get consistency in word count when possible, to make a note of what happens in each chapter, and a color-coded indicator that helps me in various ways depending on the project. Here’s the chart for the first 16 chapters of EV. (The first chapter is numbered zero, so Chapter 15 is really the 16th chapter.) I like to keep chapters under 2,000 words because it creates frequent stopping points, making the book more convenient to read without losing track of the story. 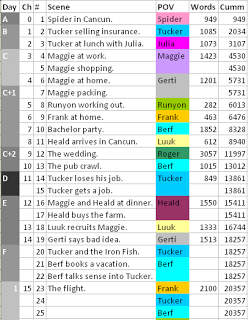 This project is in third person with multiple viewpoints, so I’m using color coding to keep track of which character perspective the story is being told from to get a sense of where gaps might exist in the narrative. You can see in the sample above that the first 10 chapters are told from 10 diferent points of view. That’s kind of risky, but I think I can make it work.In the sample below, you can see that the rainbow we had going earlier in the book has become less variegated. For nine scenes in a 3-chapter stretch, from 29-31, we only get two points of view. That’s 5,000+ words, 17-20 pages of the novel. If I didn’t have this chart, I would have to read through the entire book to get a sense of where I might need variety to break up long sections dominated by one or two characters. With a chart like this, I can see potential problem areas in a glance. 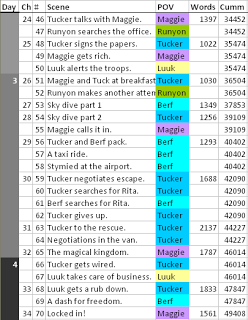 When working on my first four novels, I color coded plot lines rather than POVs, but for the same reason. If I saw a long gap where a particular subplot was not addressed, I knew I had to work in a scene to keep the plot going in the mind of the reader so they wouldn’t see it pop up 100 pages later and think, “Wait, what was that about? Who is this guy?”There. That was a bit long, but perhaps a few found it of interest. It also shows you how much of a writer geek I am and how much I obsess about this stuff. Yep, I’m a geek and I own it.